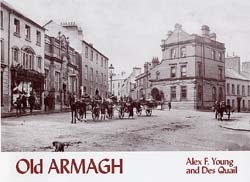 Even before St Patrick founded his first church there in AD 444, Armagh had already enjoyed a thousand years of history. However, it was with the building of its churches that the town came to prominence as the ecclesiastical centre of Ireland. It also became one of the most architecturally impressive places in the North and many of its finest buildings – including the two cathedrals, the Courthouse, Charlemont Place, and the Observatory – are featured among the fifty-two photographs which range from the early 1900s up to the 1960s. Other subjects include an early market day, the Trade Exhibition of 1913, the Tontine Assembly Rooms (lost to a bomb in 1972), the famous humpbacked bridge and the Windmill, the railway station during the heyday of steam, the Barracks, plus a number of group photos from the Royal School, showing scout groups, cricket teams and rugby players.